Ho us V is m Au e N at th it W gu W e ith st ed un 11 din iqu th g e -13 Sh th ow ! 300 Acres - $999,000 The Flying Bryant Creek Ranch is as rare as they come with million dollar views, trophy deer and turkey hunting and excellent access to water, which is sure to provide hours of fishing, swimming and canoeing enjoyment. The property is conveniently located just 3 miles from US 14 and sits on 300 acres of woods surrounded by Bryant Creek on a dead end road. This key feature provides for a very serene, secluded and scenic setting. From the moment you open the custom front door of the home, you will be overwhelmed by the impressive use of native stone and rich woods along with the massive windows which allow for views of the river below and the beautiful Missouri Ozark Mountains. The 34 foot cathedral ceiling with wood beams, the massive double native stone fireplace and the inviting outside living area create an environment of relaxation and tranquility. The gourmet kitchen is sure to please even the most demanding chef. Professional stainless steel appliances, additional pantry and a well designed work area will add to the pleasure of creating a culinary masterpiece while still being able to entertain guests and enjoy the amazing views. The master suite is designed around a single concept of pure relaxation and luxury including a fireplace, sitting area, outside screened veranda, exercise room and the continued amazing views. The master bath offers a huge slate shower with multiple heads, makeup/dressing area and a massive closet with built-ins. The property also has a 2,000 sq. ft. guest home for friends and family. It is surrounded by large landowners with agricultural fields and is located in some of the best deer hunting in Douglas County. The barn/shop is used to house equipment and provides an ample work area for any project. Whether you are looking for an incredible river property, hunting retreat or just a beautiful home in the country, this place has it all and is priced to sell. Donâ&#x20AC;&#x2122;t miss the opportunity to own this great Southwest Missouri property. Call me today for more information and to schedule your private showing. 165 Acres - $875,000 The James River Ranch is as rare as they come with Million dollar views, cattle production, horse facilities, trophy deer and turkey hunting all with excellent access to the river. Over one mile of gentle river frontage, ponds and springs. Just 3 miles from Galena on a black top road. Very peaceful and scenic setting. From the moment you open the front door, you will be in awe by the massive windows which allow for views of the river, pasture below and the beautiful Missouri Ozark Mountains. The inviting outside living area creates an environment of relaxation and tranquility. Whether you are looking for an incredible river property, cattle production, hunting retreat or just a beautiful home in the country, this place has it all, and is priced to sell. Big Valley Farm is a unique water and timber land investment opportunity on the shores of Table Rock Lake in the Southern Ozarks of Missouri. This compelling property offers a classic family estate home, which is enhanced by the financial and amenity benefits of the log home, pasture, timber and million dollar views. 4,000 sq. ft., 4BRs, 3BAs. Vaulted wood ceilings and beams, surrounded by rustic stucco walls. Open living/kitchen/dining with plenty of cabinetry and counter space in the kitchen. The land is flanked by a mix of oaks, cedar, pine, and walnut, creating an iconic setting around the perimeter of the property. This lake shore estate is ready for horses or to enjoying as a private sanctuary for wildlife. The walking/riding trails allow you to get your morning exercise or sneak into a deer stand for a morning or evening hunt. A custom gate welcomes you as you enter this private sanctuary and drive up to the stunning lake home made of stone and timbers, featuring an oak deck to enjoy dramatic lake views and capture brilliant sunsets, a hot tub, open floor plan, sensuous master suite and much more. The property is located in Reeds Spring Schools and nearby boat slips are available for purchase. This unique and stunning property is a must see. Call me today for your appointment to see this amazing property. Three Bar Farm is truly the property of a lifetime, offering beauty and seclusion as well as a solid financial opportunity as an owner/operator, cash rent and land appreciation on pasture/bottom ground properties. It is located approximately 16 miles east of Marshfield in Southwest Missouri. The property consists of slightly rolling hillsides with level creek bottoms. Approximately 85% of the land is open with a quality stand of fescue and native clovers. The farm has a nice home, good fencing and cross-fencing, two corrals, working facilities, scales and several barns including hay barn and livestock barn. The live water creek runs along the entire property with approximately 3/4 mile of frontage and several holes where fish are found. Water consists of multiple ponds, creeks, springs and wells. Wildlife is abundant at the farm where the giant whitetail deer never have to leave the property with the bedding thickets, ridge tops and bottoms giving them amazing habitat. It is very rare to find a property that has this much huntability that only Mother Nature could create. Great road frontage making access a dream. Fenced into 20 pastures with three sets of pens. More land available. Give me a call to set up a private showing of this dream property. 263 Acres - $775,850 The Double Ridge farm is made up of large wooded draws and open pasture areas with live water, a pond and springs. Property is fenced for cattle and lies just 10 minutes from Branson on a well-maintained blacktop road. Morel mushrooms are plentiful throughout the property in the spring. Double Ridge farm is surrounded by timber tracts making the deer and turkey hunting top shelf. Whether you are looking for an incredible hunting retreat, cattle property or a beautiful home site in the country, this place has it all, and the price is reasonable. Great place to build your home, raise your family or just retire. Call me today to schedule your very own private showing. Don't miss the opportunity to own this great Southwest Missouri property. 296 Acres - $997,000 This beautiful farm located just North of Lebanon is very diverse and properties like this do not come up for sale very often! It is made up of approximately 100 acres of open land that consists of hay production, along with pasture, and there is a beautiful pancake flat 50-acre bottom land field along the Niangua River that could be utilized for row crop production for corn, beans or alfalfa. Along with the farming and cattle opportunities this farm provides, the balance of the farm is in timber, providing excellent hunting for whitetails, turkeys, and other wildlife. The farm is large enough to be managed for big bucks and has plenty of hidey hole locations to plant food plots. On top of hunting, this farm has over one mile of Niangua River frontage! This crystal clear Ozark river is known for great fishing and it's absolutely beautiful. Looking to build your dream home or a weekend getaway cabin? This farm has numerous locations to build and there are several spots on the farm with very scenic views! This farm has it all! Hercules Trail Outfitters Ranch is a well laid out hunting property with live water, timber and surrounded by Hercules Glade/Mark Twain National Forest. Secluded, but still close to all the comforts of city living. Forty-five minutes from Branson, with area lakes, colleges, hospital, shows, shopping, airport and many restaurants. Shop home built in 2013 that has been well constructed and has breathtaking views of the Ozark Mountains. The land is made up of bottom ground, wooded draws and ridge tops; it has live water, ponds and numerous springs. Good access for both hunting and ranch work, with both hard surface and gravel access. 1/4 of a mile of state maintained highway. Hunting trails have been bulldozed through its wooded areas and game openings/food plots have been established. Whether on ATV or horseback, hours of trail riding fun are right out the backdoor. Whether you are looking for an incredible hunting retreat or just a beautiful sanctuary in the country, this place has it all. Approximately 3500 acres - Diverse terrain, 1200+ ac. pasture, 2000+ ac. timber, partial fenced, ponds, streams, springs, established riding trails. Approx. 5 mi. borders Mark Twain Natl. Forest. County maintained roads through the property. Many drivable roads and trails within the property itself. Easy access to Branson, Branson Airport, Springfield-Branson Natl. Airport, Bull Shoals Lake. #30344665 REDUCED TO $1,000 Per Acre. This truly unique property looks somewhat ordinary until you open the front door and step into an exquisite lodge style hideaway with a panoramic view of the Ozark woods. The natural wood and log interior is beautifully designed, making it warm and inviting. The enclosed sitting room looking out over the deck and into the trees is a wonderful spot for morning coffee. A woodland trail leads a short distance to an overlook spot at the top of a bluff offering an expansive view of Table Rock Lake. The unattached workshop with finished interior has endless potential. A gardeners/storage shed, fire pit, and game area, all accessed by a circular drive, make this a wonderfully private residence or vacation getaway. (Overlook is enjoyed on neighboring property by verbal permission only.) #60080551. $224,900. THOUGHT: “Our goal in every aspect of our work should be to exalt Jesus Christ. The results are His.” John 12:32. The Best Waterfront on Table Rock Lake! Blue Eye...$599,000. 6BR, 4BA, fireplace and a glass wall over the water. See to believe. Totally Remodeled by Craig Hudson, one of Branson’s well-known builders! Estimated Completion August 2017. This home is located in the Branson School District and features 3BR, 2BA with a split floor plan. It has been updated with wood and tile floors, brand new roof, expanded deck, privacy fence, new water heater, and garden shed. The major items are newer and ready for a new family. Nice level front yard, quiet neighborhood. Close To Branson Landing Branson...$149,900. 3BR, 2BA and 2 fireplaces! Cute, cute... lots of upgrades, new paint, new flooring, new stainless appliances, fenced back yard. You can’t beat location, 5 minutes or less to the Landing - shopping/dining, Lake Taneycomo Fishing, Tennis, and just a few blocks to the hospital. Big level fenced back yard. Just Listed - Close To Park! Branson...$179,900. Over 2,000 sq. ft. on main level with fireplace, updated kitchen, attached apartment for rental income or relative. Unfinished Lower level for workshop. Close to nice park and sits on 1/2 acre corner lot. Table Rock Lake View Blue Eye...$444,500. 2BR, 2BA, just updated with new floor coverings, furniture, flat screen TV’s. Great little vacation retreat or can be used in nightly vacation rental. Situated on 2 floors at Fall Creek Condos and has a loft Master Bedroom. Turnkey. Looking for Lake Front Acreage with Private Dock? This large home has it!! 4, possibly 5 bedrooms, 2.5 baths, 3,939 sq. ft., large open living/kitchen area. Lots of remodeling done in 2014. Walk out your back door to your own dock. Be sure to see this one!! Garage/shop 30 x 24. $434,500. #60036697. Private serene wooded setting??? This fantastic home sits on 12+ acres that is within 5 miles of shopping, schools, & medical. Master suite on main level, updated kitchen, stone fireplaces on both levels, & new wood flooring. Amazing workshop/garage (for all of your toys) PLUS a two car garage attached to home by breezeway. Seclusion plus close in - hard combination to beat or find. $299,900. #60079833. Amazing Lakeview Home in gated community. Close to all area attractions and lake activities. Additional lot next door is included in the price of the home. 10x28 boat slip and 2 waverunner drive-ups available for extra $$. $299,900. #60084423. Lake View Home - Shop - Boat Slip. Complete package for vacation or full time living. 2 complete living areas including kitchens. 2 lots provide plenty of room for all your toys. Fantastic in-law quarters if needed. 10 x 24 boat slip available for extra $$$. Very Neat & Clean. $288,500. #60083210. • Lakefront Lots Starting At $65,000. • Lakeview Lots Starting At $34,500. • 32 Acres Lakefront. $525,000. • 32 Acres On Rock Ridge Road. $189,900. Fantastic location on Indian Point Road. 3BR, 3BA, 1,901 sq. ft. home close to all Branson Attractions, Silver Dollar City, and Table Rock Lake activities. Very livable floor plan nestled in the trees on level lots. $229,900. #60076779. Great Rustic Cabin for quiet weekend get-a-ways. Full time retirement? This is the one you should not miss!! 2BR, 1BA, 1,297 Sq. Ft. Five (5) acres of woods with mountain views. Second cabin for guests. Large deck to enjoy the sunrises/sunsets of the beautiful Ozarks. Watch the wildlife. Fenced area for pets. $134,900. #60078046. Looking for a great weekend retreat that is nestled in the woods sitting on 7+ acres?? This is for you!! 2BR, 2BA, 960 sq. ft., located close to Table Rock Lake and lake activities, If not a lake bluff Branson activities, shopping, and Silver Dollar City close by. $79,900. #60075919. SPECTACULAR, EXECUTIVE ESTATE lavishly set on approximately 4 acres m/l of Table Rock lake front property with panoramic views from every room. As you approach the front entry, it provides a breathtaking stone & wrought iron courtyard, beautifully landscaped. This home is truly a craftsman’s work of art, with gourmet kitchen, private sunroom off Master suite, 4 fireplaces, soaring ceilings & a 6 level deck, partially covered with it’s own stone fireplace, media & outdoor kitchen. Truly an amazing home! Gated security entrance. 2 Boat Slips available at additional $$. $1,600,000. Also being offered with 6 additional lakefront acres for $1,850,000. Includes MLS numbers 60020581 & 60020600. This beautiful & private Table Rock Lake gated development is what dreams are made of! Exceptional 3 acres m/l lakefront lot located at the end of a quiet cul-de-sac. Dock is just a short walk away. Two 10x28 boat slips available for additional $$. $150,000. Lake Front Lot, Gentle walk to water!!! Millwood Estates. 10x28 boat slip available for additional $$. $180,000. Enjoy the picturesque drive & the peaceful & tranquil setting of Wood Ridge Estates! Mountainous Ozark views & the serenity of Table Rock Lake in the distance. Boat launch just minutes down the street. $20,000. Extraordinary Corner, 3 Acres Table Rock Lakefront in gated development! Dock is located just a short walk away. Two 10x28 boat slips available for additional $$. $150,000. SACRIFICE PRICE ON GORGEOUS LOT! (417) 887-6664 180 DEGREE VIEW: Located in a quiet development on Table Rock Lake, tucked away from the hustle and bustle of the world. An open floor plan with lots of windows, an enclosed glass porch, and multilevel decks lets you fully enjoy the fabulous view. Perfect for either retirement or a vacation home. There is a boat slip in the community dock just minutes away that may be purchased along with this home. The community pool and tennis courts are a welcome amenity, too. $215,000. Need help designing your ad? Give me a call! 10 ACRE LAKEFRONT on TABLE ROCK LAKE! Quiet and secluded in a newer development. Wet weather creek runs through property. Great investment, retirement or vacation property. Owner financing to qualified buyer. $99,000. Or Lots For Sale In Blue Eye, Missouri. Build your home on one of our beautiful, peaceful lots in scenic Blue Eye, Mo. Lot prices include hook up to the private water and sewer systems! Call for more information. We Have Pet-friendly Options Each apartment home features all electric kitchen and washer/dryer hook ups Upstairs and downstairs apartments available. 2BR, 1BA 3BR, 2BA Starting at $550/mo. 2BR, 1BA Starting at $600/mo. Studio Efficiency With Full Kitchen Starting at $550/mo. REDUCED! The beautiful home sits on over 3.5 acres and has great curb appeal. With 5BRs and 6BAs, youâ&#x20AC;&#x2122;ve got room to roam both inside and out. The front turret, hardwood floors, granite counter tops and beautiful fireplace is just the tip of the long list of home features. Boatslip available. #60070412. WHAT A GREAT NEIGHBORHOOD! Located only 10 minutes from downtown Branson West, keeps you close to shopping and conveniences. With almost 4,000 finished sq. ft. and another 700 unfinished, sitting on .9 acres will give you all the space you need. Everything you need is on the main level, and tall ceilings up and down, gas fireplace, great room and many other features make this a must see home. #60079685. One level 3BR, 2BA home in Millwood Estates. The home has a split bedroom layout, with a very nice 4-season room on the back of the home to enjoy the lakeview and the 3/4 acre flat lot. There is a 3-car garage and good size workshop on the west end, for lake toys or hobby space. 10x28 boat slip just 100 yards away. FANTASTIC LAKEVIEWS FROM THE MOMENT YOU WALK IN THE FRONT DOOR OF THE DELIGHTFUL HOME IN THE GATED COMMUNITY OF eMERALD pOINTE! Exclusive 43-Acre Lakefront Estate W/Private 2-Stall Dock! Lakefront “Montana” Custom Hand Peeled 10” Log Home On 6 Acre Gated Estate With Private Boat Dock! Lakefront old-world estate with Tuscan inspiration! No Expense Or Detail Has Been Spared On This Luxurious One Of A Kind Estate With Private Boat Dock! Almost 3,000 Sq. Ft. + 800 Sq. Ft. Guest House + 27x27 Shop! Country Living With Covered Front Porch! One Of The Best Locations In Branson! Downtown Branson Office/ Retail Building! 9 Acre, Lakeview Home Overlooking Beaver Lake! fRENCH COUNTRY TOWNHOME IN LAKESIDE GATED GRAND CRU! The Buck Stops Here! $79,900 Brand new 1,200 sq. ft., 2 Bedroom, 2 Bath on large lot only 200’ gentle walk to lake. •	Free access to large pool, clubhouse, tennis courts, and concrete boat ramp only 100 yards away. •	Easy access to water’s edge across the street. Under Construction - Twin to this one (which is SOLD). Shell Price $79,900. Turn-Key Including Appliances $139,900 Search as you may, you won’t find a home of this quality at a lower price! You pick all the fixtures, cabinets and appliances (allowance applies). By the way, we’ve only been in business for a short period of 40 years, and plan to be here way after the 1-year warranty runs out! We have several locations from the Arkansas/Missouri state line to Shell Knob, Missouri. Lake Front and View, Acreage, Golf Course Frontage, Etc. More than 500 Homes built since 1995. $974,500 This Beautiful New French Style home at Rivermist on the Finley was meticulously and thoughtfully designed for every need! From the open kitchen and spacious family room to the covered and screened in porch with wood burning fireplace, it is truly great for all occasions! This home offers all stainless steel appliances, hardwood floors, vaulted open beam ceilings, and plenty of storage, with it’s secluded and elegant country feel from wild life to the soak-in tub and walk-in shower in the master suite. The 6’ ceiling crawl space offers tons of storage and inside access to the John Deere room. Picture windows strategically placed throughout the home allows for a beautiful view of the countryside and natural lighting. 2.80 Acres, Lot #5. 2.80 Acres, Lot #2. 3.15 Acres, Lot #16. 3.70 Acres, Lot #12. 1.46 Acre. A versatile property with over 85% zoned General Retail. The remainder is residential with an existing home. Possible multi-family property. Located just north of Fassnight Park and Parkview High School. 417-299-2988 $240,000 | #60079592 Two adjacent lots. Mostly level site ready to build with utilities. Across from Willard Fire Station with good access to Springfield and Willard. Near Springfield Branson Regional Airport. Experience breathtaking lake views from the deck of this 3 BR ranch style home. Located off DD Highway this home sits high above Table Rock Lake and features outside living space from both levels. The open floor plan upstairs compliments the panoramic views while the French doors in the kitchen and bedrooms all open to outside decks and patios. The level front drive into the 2 car garage is sure to please while this amazing home sits nestled in very quiet neighborhood. The laundry room is spacious and there is an extra large storage room/ bonus room in the lower level. The master bedroom is located on the main level and features a bath and two large closets. The landscaping is well maintained and features beautiful trees and crepe myrtles. The driveway and entrance road are paved. This six unit apartment building is in the heart of Kimberling City and is one block East of Missouri State Highway 13 and within walking distance of Table Rock Lake. All units either have balconies or patios. Parking is available in the front and on one side. Large trees shelter the back and sides of the building. These apartments are conveniently locat ed near shopping, restaurants, medical, and may other services. Their location is an easy drive to the Branson area jobs and entertainment. The Reeds Spring Schools system provide excellent facilities. Many churches are located in the community. (417) 272-6337- Office Mary-Ann Dailey (417) 334-3222 ext. 102 dailey.mary-ann@ aaamissouri.com AAA membership requires the separate payment of annual dues and an enrollment fee for new members. Membership is required for new insureds. *The Auto + Home (multi-policy) discount requires the purchase of auto and home insurance from AAA affiliated insurers. Discounts may apply to select coverages, vary by policy and are conditional. AAA personal lines insurance is provided by Automobile Club Inter-Insurance Exchange or Auto Club Family Insurance Company. Copyright © 2016 Automobile Club of Missouri. All Rights Reserved. Help-U-Sell Realty Choices SELL YOUR HOUSE FOR $2,495!!! FLAT FEE AND FULL SERVICE! Wake up each morning to your amazing view of Table Rock Lake! This home has four large bedrooms and three luxurious bathrooms, all full sized! The kitchen has beautiful hickory cabinets and granite countertops looking very sleek and stylish! The home offers two gorgeous living areas! The finished basement not only allows you to have tons of storage space, but also gives you many options on how you would like to entertain your guests, including the media room, a wet bar, and a beautiful brick fireplace for everyone to enjoy! But, letâ&#x20AC;&#x2122;s not forget the outdoors of this beauty...The mature landscaping is completely gorgeous, and makes outside feel that much more peaceful and relaxed. You have options to look at your incredible view as you lounge on your spacious deck, or entertain your guests down below as you fire up the grill on your very large patio!! Pristine HOME IN KICKAPOO SCHOOLS! All brick home on corner lot in great subdivision. Like-new condition in this well kept home. Split 3 bedroom, 2 full bath plan with nice sized family room with gas fireplace, kitchen/dining combo with a great view of the front yard. The backyard is large and has a privacy fence with nice double-wide gate for easy access. #60084409. Wonderful all brick, two-story walk-out on Table Rock Lake. Fabulous deck the length of the home to enjoy the view and entertain! This 4BR, 3.5BA, 3,800 sq. ft. home is loaded!! SOLD & SELLER SAVED $6,255!!! This spectacular, updated home features a unique floor plan and the finest workmanship and materials. There are 4BRs and 4BAs, a great kitchen and two-story family room. The views are magnificent with easy access to the lake and a boat slip available. Priced at $499,900 with a boat slip available. #60080334. Located in Thousand Hills, this beautiful well appointed and fully furnished condo features master bedroom suite, guest bedroom, 2 baths and great sunroom. Priced to sell at $109,900. #60068346. This cozy 2BR home is located in the heart of Branson near all shopping and attractions. Cozy and well maintained, this is the perfect starter home or for a buyer needing a home close to everything. Priced at $89,900. #60072532. Need something for a home based business This spacious and newly redecorated home features a large living room, family room, 3 bedrooms and 2 baths with a nice kitchen. Also included is huge bonus area that could be used for a home based business. Well located just off main highway for easy access. Priced to sell at $139,900. #600725684. This large building has recently been a auction house and was once a flea market. It could have a variety of uses with large garage doors and office space. Included is 12 bay storage units. Priced at $175,000 for everything. #600737654. Looking For A BRIGHT Idea On How To Sell Your Home? Give Robin A Call Today! Lake Front on 3 acres high above the Kings River with Panoramic Views, 5BR, 4BA custom log home. RV barn & shop w/ separate septic & water. Open floor plan with a Large all purpose room, main floor master & lower level master with private bath. Radiant heated floors down & tons of other features. 3rd Party Boat Slip Available for $25k. #60024690. $365,000. Your own private paradise, only seconds from the lake. Over 5 acres of woods with a charming yard shaded with mature trees. Gorgeous, custom built, cedar sided home with stone accents. Open floor plan with Bamboo Hard wood & tile floors. Master suite with walk in closet & bath boasting a shower & jetted tub. 3BD, 3BA with oversized garage & huge bonus room. Over 1,000 sq ft of covered front and back decks, fire pit, & donâ&#x20AC;&#x2122;t forget the 40x40 Quonset shop! #60084442. $299,000. PANORAMIC VIEW, Large Screened in Porch of this Beautiful Lake View Home! 2 levels of living space with numerous glass sliding doors facing the lake view side. Well-maintained, recently updated 3BR, 3BA, 3,910 sq. ft. with plenty of room, tons of storage and an extra kitchenette with wet bar downstairs. 10x24 Boat Slip Avail. for extra $$$. #60079029. $249,900. Low Maintenance 1BR Ranch home with large covered front porch and covered back patio situated on 8 acres on the corner of 76 Hwy and M Hwy between Cassville and Shell Knob. Short drive to the lake and great location. The property contains the original storefront and that can be rehabbed for a small business. This property is priced to sell. $85,000. 84+ Acres cleared/wooded combo ready to run cattle, great hay production and more. Spring fed pond plus another pond and wet weather creek. 4BR, 1BA home with detached pole barn garage and large hay barn. Investment Opportunity. Plenty of room to roam, rental income available. Currently running 23 cattle, room for more. Fenced and cross fenced. 40+ acres currently farmable. #60079073. $230,000. All electric completely remodeled home on 4.2 acres with a 40x60 shop. Close to town & lake, beautiful remodel and an entire 2nd floor addition. 4BD plus an office with 3BA. Updates include Large eat in kitchen, 2 living areas, walk in closets, custom bathrooms, new roof, heating, cooling, and water heater. Covered & screened front porch, large covered back deck, tons of room in the privacy fenced yard. Additional acreage includes second well access. #60083172. $239,900. Lake Front 3BD 2BA, walk out basement that has water access right behind the home, two tier deck & a lake view. Main floor kitchen & living room. Lower level with family room & wet bar. 4th bedroom unfinished on the lower level is great storage or room for improvement. New gravel drive & newer roof. Adjoining lot is the perfect spot to add a shop/garage for the lake toys & creating a circle drive. Close to town and marina! #60083627. $199,000. LAKE FRONT, RANCH-STYLE home on 1.53AC lot. This creative floor plan has 2 separate sleeping/living areas each with 2BR, 1BA and its own HVAC. Living spaces are separated by a 2-car attached garage, an over-sized 1-car garage & a covered carport between garages. 2 large deck areas run along the lakeside of the home with a hot tub. PLUS an 8x20 Boat Slip is INCLUDED & Seller is providing a Home Warranty. #60081852. $225,000. LAKEFRONT NEAR CAMPBELL POINT MARINA! Boat slip included. Panoramic views in this 3BR, 3BA, 3,084 sq. ft., fresh paint, updated kitchen with granite, stainless steel appliances & flooring. Open floor plan, 2 levels of living, tons of storage, plus easy to maintain landscaping & outdoor space for entertaining. Home warranty included. #60075517. $345,000. Investment opportunity. Plenty of Room to roam, rental income available. 84+ acres cleared/wooded combo ready to run cattle, great hay production and more. Spring fed pond plus another pond and wet weather creek. 4BR, 1BA home with detached pole barn garage and large hay barn. Currently running 23 cattle, room for more. Fenced and cross fenced. 40+ acres currently farmable. #60079072. $230,000. Beautiful, one-of-a-kind home with many, many extras. Large open kitchen & great room with breakfast bar. Formal dining & insulated floors complemented with gorgeous Brazilian hardwood floors. Oversize garage with 12 foot ceiling with storage. Two separate furnaces & air conditioners. Whole house voltage protector & Generator with transfer switch. 23’x44’ ‘’L’’ shaped deck. Two shops; one 40x50 15 foot walls, concrete heated floor with 14x14 power overhead door. Floor hoist & overhead hoist, air conditioned & heated with office/bar & 1/2 bath. 30x40 shop with 14’ walls. Two propane tanks, one 1000 gallon owned & 500 gallon leased. Many more extras, must see to appreciate all the extras. #60069834. $425,000. This is a great lake home with detached garage & nice wrap around deck on the lakeside 36’x44’x36. Walkout finished basement area with lots of storage. Open floor plan with kitchen eat-in bar. 10x24 slip & lift available for extra $$. Lake front, gentle slope to lake. #60074083. $229,500. 24 acres on Hwy. 65 in Hollister. Excellent land for development. How about a Hotel, would be the first hotel entering into the Hollister, Branson area...just off the Airport road. 600 foot of frontage on highway 265 & also overlooks highway 65 frontage just south of highway 265 on right. Stone House & 2.6 acres adjacent to this property. Not listed but buyers might want a 2400 square farm home to go with the 24 acres. #60044324. $675,000. 40 acre property with Road Easement for access to land. Sign is placed on the corner at the road easement access to property., Directions From 86 and 13, go south towards Blue Eye, at EE turn east and go about 3 miles to Sign on Fence. #60053711. $65,000. This 15 acres at 528 Dry Run Road in Shell Knob boasts lots of beautiful Oak & Walnut Trees that can be sold. Once cleared for building your lake dream home...you have a gorgeous view of the lake. This is a gentle slope with a flat high ridge, perfect for building on... & you’ll have a million dollar view of Table Rock Lake. 10x28 slip sold separately for $28,000. This is a property you will fall in love with..... come see what we mean.....#60035535. $329,000. TWO CABINS NESTLED ON OVER ONE ACRE of gentle walk to the water lakefront land. Main cabin has 1BR, 2BAs, beautiful wood accents throughout, new windows & a large deck facing the lake. Cabin two has 2 units. One 1BA units for additional family & guests. 2 outbuildings, well house & 2 septics. One can be used as an RV hookup. A must see! Boat launch across the street. $260,000. Nice, clean one level home located in a quiet neighborhood in Purdy. Hard to find 4BR, 2BA home with new laminate flooring, newer HVAC and metal roof. Large master bedroom and bath, nice level yard for your growing family. #60080082. $87,500. Move in Ready Lakefront/lakeview cedar sided home nestled on two lake lots. Privacy and beauty in abundance! This home has been recently updated with granite counter tops, laminate flooring and paint and new roof. Open, light and bright, plus all appliances and furnishings stay! Oversized one car garage, plus the back deck is wired for a hot tub! A must see! #60077548. $189,500. Welcome home to 89 Green Cottage Drive! This immaculate executive style cottage is custom built throughout. Granite counter tops, hard wood floors, carpet, tile and three decks. Walk the gently sloped trail to the waters edge of Table Rock Lake. Warm and inviting, with and upper level that can be used as separate living quarters! 10x24 boat slip available for $25,000. Don’t pass this one up! #60083768. $425,000. Lakefront, Lakeview easy walk to water! Come enjoy the tranquility of Table Rock Lake from this immaculately kept one level home. This large four bedroom two bath home has all you need! Large formal dining room, updated kitchen with granite counter tops, cabinets and more. Newly added gazebo area with hot tub and seating area to enjoy the beauty of the lake. Park-like setting, close to Big M Marina for all your lake fun! #60083827. $249,900. Endless Possibilities for This Commercial Building! Over 2,200 Square Feet of Usable Space. Medical/dental, Office Space, Educational Resources, Etc. X-ray Room Including a Waiting Room, Receptionist Office, 2BAs and Office Space. Ample Parking........endless Possibilities. Newer A/c Unit Approximately 3 Years Ago! Shower and Living Space Available Too! #60080617. $42,900. Whether you live in a property or own it for investment purposes, you care about it. As a tenant, the property you live in is your home, the center of your life, where you interact with your family and pets and daily routine. As an investor, a property is part of your plan for the future, so it’s important it holds its value. At Ozarks Property Management, we’ve learned one thing in our decades of experience: making tenants feel cared for and helping owners grow their investments is one and the same. By taking great care of properties and tenants, we also protect investment value. What’s not to like? With experience in real estate since 1984, we aren’t some upstart property management company trying our hand at a new venture. We are experienced, dedicated and professional through and through. Our expertise lies in taking excellent care of the properties we manage, finding and getting qualified applicants into those properties, and maintaining great relationships with both owners and tenants. Need a place to live and want to take a look at our properties? Interested in hiring an experienced property management team to lift the burden of management from your own shoulders? We can help with all of this and more, so call today. On 3 acres & just 1,300 feet to Table Rock Lake and boat launch! Open where the cabin sits for nice yard, parking & wildlife to enter with the balance in woods. 2 bedroom, 1 bath, needs just a little work. $42,500. Call Today!! High end furnishing, on nightly rental program with bookings, too! Full time living or use as vacation home with an income!! Very close to Silver Dollar City off Indian Point Road. Includes membership to clubhouse and indoor pool. 39-5. #60074528. $115,000. Updated 2/2 updated unit overlooking Table Rock Lake. Located in Cape Fair on HUGE 3 parcel lot, almost 1 acre! View through the trees of the lake! 2nd tier. $44,900. #60079095. 2BR/2BA located in the Center of the Resort. Easy access to EVERYTHING! Successful Nightly Rental, Fully Furnished & ready for YOU! Vacation Home? Full-time Living? Keep as a Nightly Rental - Your choice! Unit has access to Indoor Heated Pool & Splash Pad in the new Clubhouse at ‘’The Landing at Eagle’s Nest Resort’’. Additional amenities include: Outdoor Pool, Outdoor Hot Tub, Playground Area, Tennis Court, Boat Parking & Workout Facility and More! $92,900. #60074553. Tastefully Decorated, 2BR/2BA Condo with Centralized Location. Steps away from Outdoor Pool, Playground & Tennis Court. Successful Nightly Rental, Fully Furnished, TURN KEY! Unit has access to Indoor Heated Pool & Splash Pad in the new Clubhouse at ‘’The Landing at Eagle’s Nest Resort’’. Additional amenities include: Outdoor Pool, Outdoor Hot Tub, Playground Area, Tennis Court, Boat Parking & Workout Facility and More! $91,000. #60074548. Brand New Luxury Condominiums - 2, 3 and 4 Bedrooms with Table Rock Lake Views, just minutes to Silver Dollar City. Nightly Rental Approved. Open and Spacious Floor plans, 9’ Ceilings, Custom Hardwood Cabinets, Private Decks offer Panoramic Views. Year Round Amenities – Indoor/Outdoor Pools and Splash Pads, Private Gym, Clubhouse, Owner’s Lounge, Boat/RV Parking. Elevator provides Easy Access to All Levels. Starting at $173,000. Call TODAY for more information. Nightly Rentals With Booking! In the beautiful Cow Creek Area with YEAR ROUND LAKE VIEW! 4 Bedroom/3 Bathroom, Walk-Out with Living room and Intimate den. Upper and Lower Decks, Attached 2 Car Garage. Wonderful LAKE HOME, Perfect for everyday living or Vacation Home. Priced to sell at $137,500. #60053082. Once a Corner Store & Deli, could accommodate that & so much more. How about a Tea Room/ Antique Shop, just off the Galena Square? Located on the Northwest corner of Hwy. 248, directly across the street from the Stone County Library. Business on the main level, living quarters on the lower. 4 City lots with City utilities. Need more information? Want to get inside & look around? CALL TODAY! $130,000. ENDLESS POSSIBILITIES IS AN UNDERSTATEMENT! Over 5 Acres With Affordable 3BR/2BA! Quiet Lampe location just minutes to Table Rock Lake! 5+ acres with 2004 stick built 3BR/2BA home with attached 1 car garage. Room for animals, a shop, etc.... $113,400. #60072334. 5.37 Acres in Stone County just past Taney County line. Almost impossible to find a large parcel with Lake View in this area! 12 platted lots or keep what you want and sell the rest. 2,100 ft. road frontage for your custom lake property fence and gate!! $110,000. #60028182. Just 1/2 mile to Long Creek Marina and just off Hwy. 86 makes for an easy commute. Onsite soil & sewage evaluation complete. $229,900. #60064965. Inventory is low and buyers are here! Call today to get your property SOLD! • Branson Creek, on the Back 9 of #60020756. • 1 Acre +/- on Busy Hwy. 13. Need Buffalo Ridge Golf Course. $52,495. #60039253. • 26+/Acres with endless Shop? $29,895. #60028191. opportunity. Bus. 13. Not in city, • 5.13 Acres on quiet street in Lampe. • Cedar Meadows. Branson Lake View. county!! $39,900. #60065997. $32,500. #60053759. 3.24 Acres. $42,495. #60039239. • 1.3 Acres in Reeds Spring Schools. Community Water!! Off DD Hwy. $5,990. #60076680. 2.2+ acres in Reeds Spring Schools. Year round Lake/ Water view and Community Water!! Off DD Hwy.! Hurry on this one!! $24,950. #60076678. 10x24 Boat Slips available for $25,000 Additional. • 6.33 Acres Hwy. 13 North of Branson • 7.7 Acres on Quiet Hillside. Feels West. $150,000. #60049423. like you are in the middle of the • 1.5 Acre lot in Buttonwood, wilderness - but close to Galena Kimberling City. City water. $7,800. Schools. $15,960. #60078477. Build YOUR Dream Home among highend Lake homes! This lot is almost FLAT! Lot faces Little Aunts Creek Road. Water and sewer at property line of each lot! Affordable! Boat Slip available. $32,500. #60011917.
overlook subdivision on table rock lake. LAKEFRONT with 4 Slip Dock Included. Cute Lake Home with Lakeview, 2BR, 2BA, all new Kitchen Appliances, Large Outbldg. for storage or workshop. Boat Dock has 2 lifts & Lockers. Home is well landscaped. $249,900. #60078996. LAKEFRONT HOME. Great Home with 4BR, 2.5BAs, 2 Kitchens, Large Master BR, 24x30 Workshop/Storage. 5 Lots Included. Boat Slip Available for $$$. 20 ft. Pontoon with 90Hp Honda 4-Stroke Available. $297,500. #60062696. MINI-FARM. Really Nice Ranch style home on 2.5 acres, 3BR, 1.5BA w/Open Floor Plan, Formal Dining Area, Fireplace in Living Room, Sun Room & Full Bsmt. w/Fireplace, New Private Well & New Heat Pump, Fenced Yard, 2 Huge Outbldgs. - 22x30 & 44x60 w/Concrete Floor. 200 amp service. $175,000. #60057109. LAKE HOME. Neat & Clean 3BR, 2BA home on level lot, with Winter View. Open Floor Plan, Large Kitchen-Dining Area. Large Garage (24x30) for all of your Toys, Close to the lake & launch area, Possible Boatslip. $99,900. #60062090. COMMERCIAL BLDGS. 2 Huge Buildings that could be used for Storage, Manufacturing or Sales. One 10,500 sq. ft., one 6,672 sq. ft. Half Interest in Private Well & City Sewer Hook-up close by. Large Loading Doors in each bldg. on one acre. Close to Marina & Launch Area. $445,000. #60072870. 2 LAKEFRONT LOTS. Both Lots are Gentle Slope to the lake. Both Lots are over 3/4 acre. Build your dream home in this Lakeside Subdivision. Boat Slip Available. $99,900. #60062090. Specializing in Lake Property Homes, Condos and Land. do. Cathedral ceiling, 2016 new air conditioner, new stove, 2015 new paint, new flooring, some new fixtures and misc., home warranty. Center of Branson - restaurants, shopping and a golf course. $89,500. home offers 1,760 sq. ft. 2BR, 2BA, open floor plan, fireplace, custom cabinets, stainless steel appliances, walkin closets, garden tub and walk-in shower in Master Bedroom, and location, location, location... only minutes away from Branson Landing and only feet away from the shore. The deck offers 180 degree panoramic view of Lake Taneycomo. $219,000. #60084283. Think Renee Morfin! I am a bilingual, licensed Realtor in Missouri and Arkansas. 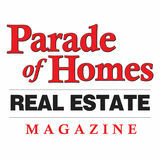 With 10 years of experience I am ready to help Buyers and Sellers. Everything I touch turns to sold! Keeping the American dream alive! What is the most important line of communication between the Seller and the Buyer? Your REALTOR! I recognize the importance of home ownership. We don’t just sell houses. We help you find where dreams are made, where family traditions are carried on, building stronger families. Our community is built on dreams that have come true like our business. Teamwork from a team that works, we also offer Free Real estate education and resources for potential buyers and sellers. With a tradition of trust, your property is our priority! I’m your realtor, Welcome home. Ofrecer una variedad de servicios sobre bienes raíces dirigidas especialmente a la comunidad Latina que prefiere comunicarse en Español. Aqui podrás encontrar casas en venta, programas hipotecarios que benefician a primeros compradores, artículos y consejos todos en tu idioma pero lo más importante es que puedes contar con los servicios de un Agente en tu Idioma. bobsandsbr@gmail.com • www.bobsands.caroljones.com GREAT LAKE HOME! $499,900 If you are looking for that great lake home with lots of room for your family and friends, this is it. Over 5,000 Sq. Ft. to entertain all of them. 6BRs, 5BAs with a 30x50 Drive-Thru RV Barn on 2.8 acres, 3 car garage attached. Great Kitchen with large pantry and a electric Induction cooktop stove. Gas fireplace, covered deck. The one car Garage is 12.10 x 27.3 room for a big boat. Lots of storage 21 x 23 and one that is 11.4 x 14. Nice safe room. 2 hot water tanks. All this with a lake view. This home has 36’’ hallway and doors. Do not pass this one up. Gated community. Boat Launch down the street. Boat Slip Available by 3rd party for extra $$ Great home at this price! #60066354. $169,900 This 2,880 Sq. Ft. Lake View home is ready for you with a metal roof only 3 years old. Nice kitchen with dining room. Nice cabinets with pull out drawers. Large living room with a big view of the Lake with a fireplace. New Lapboard Siding in 2013. Nice 2 car garage with a view of the lake also. The Large walkout Basement is ready for you to make this home yours. Garage is 21’.11’’ X 23’.3’’ New AC and Lennox Furnace in 2015. Whirlpool Water Softener. You have 2 covered Decks NEW IN 2013 to enjoy the Big Lake View. Front Porch, All this in Kimberling City with only minutes to shopping and Branson. You got to come and take a look at this great home and then stay for the BIG VIEW! Very Nice Home. Boat Slip Available by 3rd. party. #60070896. August 12th 10:00 a.m.-2:00 p.m. Welcome to Whispering Meadows, featuring breathtaking views of the Ozarks with many sites featuring full unfinished walkout basements. All homes feature at least 3 bedrooms, two bathrooms, and a two-car garage. Welcome to Evergreen Ridge Estates in Hollister, Missouri. Nestled in a quiet, family-friendly neighborhood, this subdivision is conveniently located just minutes from Hollister schools, Historic Downtown Hollister and the College of the Ozarks. Enjoy great food, family fun, and shopping just minutes away at Branson Landing! Several flat lots available. Call now! Going fast! Tracy Langdale Buyer Specialist If you’re looking for a Buyer’s agent specializing in the Tri-Lakes area, give Tracy a call. With over 10 years experience as a High Volume Buyer’s agent, Tracy can show you any property listed locally in the MLS system. Tracy will go the extra mile to match Buyers with the home of their dreams. amazing table rock lake view REDUCED! Only minutes from downtown Kimberling City, the Port of Kimberling Marina, and only 35 minutes to Branson. 3BR, 2BA, four season Sun Room, kitchen with an abundance of cabinets, wood burning fireplace. Boat slip available thru 3rd party for additional $. MLS#60075940 $199,900. Water Front and View with 2-12x30 slips available. 1 slip $35,000 or both for $60,000. Large slips close to unlimited acreage of State Forest. Fishing, hunting galore with lots of hardwood trees, oak & hickory on property. 240’ of lakefront and 240’ of road frontage. Ozark Mountain country view. Nice trail to the lake, on a dead-end road with limited traffic. Short drive to Branson West Airport, 10 minutes to Branson West Super Walmart and 20 minute boat ride to Hideaway Lake Marina. #60076209. $85,000. Wonderful condo in gated community of Palace View Condos. This 3-BR/2-BA unit has a great view from the covered deck of one of the pools and the beautiful grounds. Huge bedrooms along with a walk-in closet in the master bedroom round out this spacious unit. Wet bar just off the kitchen and wood burning fireplace in the living room. Amenities include exercise room, two pools, sewer, water, trash, snow removal and gated entrance what a great place to live! #60083851. $137,500. Elegant home with great landscaping located in a quiet setting is this 4BR/3.5 BA home. easy-living open layout, covered deck, dining/kitchen area opening to both the covered and open deck. Living room with vaulted ceiling, office/TV room, guest bedroom, kitchen with elegant dining area oversized master suite featuring coffered ceiling end its own sitting area. At-home playground for the kids or grandkids. Need an in-law area, John Deere garage, lots of great storage? Home also backs up to National Forest to hike, hunt or just enjoy the beauty of nature. #60083849. $192,500. Completely Remodeled and up to the minute Decor: Granite, Hardwood, Light Fixtures Etc. Super Clean and move in ready. The Seller spared no expense while renovating this 4 bedroom, 3-1/2 bath home. Located in the heart of Kimberling City. Close to shopping, churches, Dr’s, and Table Rock Lake! 2 Car Detached Garage with Cabinets and workshop area. Completely painted inside and out with tons of Charm! Main Level Living! This home has a wonderful home office and separate entrance for Mother-in-Law set up on the lower level. Cottage feel and ready for the new owner. The detached 2 car garage has pull down stairs with a huge amount of storage for Christmas decor etc. You will love it! Everything has already been done... bring your family and friends! There is plenty of room for everyone! #60078028. $249,900. Welcome to Whispering Meadows, located in the vacation and live entertainment mecca of Branson, Missouri, where you’re only minutes from family attractions such as Silver Dollar City and the Branson Strip. Whispering Meadows features breathtaking views of the Ozarks with many sites featuring full unfinished walkout basements. All homes feature at least 3 bedrooms, two bathrooms, and a two-car garage. Exclusive, gated community tucked away in the heart of the Ozarks with breathtaking views in all directions! 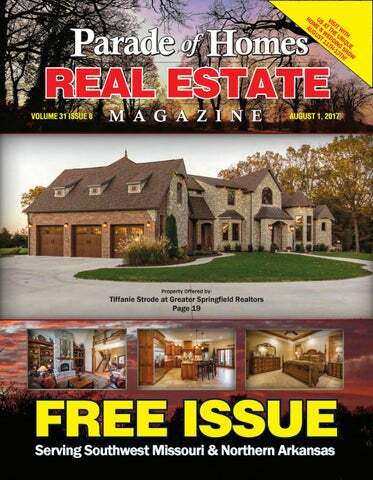 Don’t miss your opportunity build your dream home in this Ozarks Oasis. Easy access to Mo. 65 and Hwy. 86 to carry you to Table Rock Lake, Historic Downtown Hollister, and the Family-Friendliest vacation destination in the country, Branson! Many lots suited perfectly for that walk-out basement you’ve always dreamed of, starting at just $17,900! Price does not include lot. 2, 3 and 4 bedroom coming Spring â&#x20AC;&#x2DC;18! This one will knock your socks off! 2,050 sq. ft. all on one level plus a man cave. 3 bedroom, 3 bath, #60075562. Looking to downsize, then this is it! 3 bedroom, 2 car attached garage with 1,757 sq. ft. $295,500. This new one will be completed in the fall. 3,200 sq. ft. with 3 bedrooms, 2 baths. Great location. #60080397. 10403 Bran so n Land i ng B l vd. Walk out your back door to your dock! Located in Forest Park, this lake home is furnished and waiting for your family to start living the dream! Walk in the front door to vaulted ceilings and beautiful windows. • gift shop • thrift store • meal delivery • information desks and more. Contact Volunteer Services at 417-335-7114, Monday through Thursday, 9 a.m. - 2 p.m. for additional information. A Very Special Thank You To Our Rack Location Providers! Visit any of these locations to find our magazine. • Treasure Lake - 1 Treasure Lake Drive • Tri-Lakes Board of Realtors - 2875 MO-265 • Victorian Village - 3042-3043-3044 Shepherd of the Hills Expy. • Young’s Lakeside Tire & Wheel - 947 E. State Hwy. 76 • Wal-Mart - 2050 W. Hwy. 76 • Ozarks Official Welcome Center - 1209 W. 76 Country Blvd. • Wildwood Indoor Mini Golf - 200 Wildwood Drive • Willow Tree Inn & RV Park - 3381 Shepherd of the Hills Expy. • Steed Communities - 129 Pinnacle Shores Dr.
• American Check Cashers - 1816 S. Glenstone • Avanzare Italian Dining - 1908 S. Glenstone • Big Momma’s Coffee - 217 E. Commercial • Buckingham’s Smokehouse Bar-B-Q - 2415 N. Glenstone • CJR Realtors - 3600 S. National • Elite Mercedes - 3727 S. Campbell Ave. • H&R Block - 312 W. Commercial • Jimmy’s Egg - 3837 S. Campbell • Murney Associates, Realtors® - 1625 East Primrose • Nearly Famous Deli & Pasta House - 2708 S. Glenstone • Norman’s Bridal - 317 South Ave. • Phillips/Conoco Station - 1472 E. Kearney • Phillips 66 - 2540 N. Glenstone • Pizza House - 312 E. Commercial • Price Cutter - 3260 E. Battlefield • Price Cutter - 712 W. Commercial • Signal Food & Gas - 2810 E. Battlefield • Signal Food & Gas - 960 S. Glenstone • Signal Food & Gas - 2415 S. Campbell • Springfield Post Office - 1442 Glenstone • Tropical Smoothie Cafe - 3811 S. Campbell • Whole Hog Cafe - 224 W. Sunshine • The Willow Branch - 1901 E. S. Glenstone • Ziggie’s Cafe - 2515 N. Glenstone More Locations being Added Every Week! If you would like to add your location to our list, contact us at 417-334-6671. At Skaggs Foundation, our mission is to support community initiatives that improve health and wellness in Taney and Stone counties. Here are a few ways we support our community: • Skaggs Foundation is pleased to provide scholarships to students pursuing education, certification and degrees in the health care industry. To be eligible to apply, students must be a resident of Taney or Stone counties in Missouri or Boone County in Arkansas, be employed by Cox Medical Center Branson or have a family member employed at Cox Branson. Since 2002, Skaggs Foundation has awarded more than $312,000 in scholarships to area students. • Following a heart attack, a patient can expect to pay on average $900 out-of-pocket to attend 12-weeks of cardiac rehab – rehab that is vital to helping the patient rebuild strength and endurance. Skaggs Foundation is proud to provide a Cardiac and Pulmonary Rehab Scholarship Fund that ensures no patient is turned away from these important services due to the inability to pay. • Babies don’t come with instructions. Thankfully, there’s FeelBetterBaby.com, a website where you can learn valuable information on caring for your young child, how to plan for a well-baby checkup and what you need to know when your baby is sick. This Skaggs Foundation project is made possible by a generous grant from Missouri Foundation for Health. To find out more or to donate to our programs and initiatives, visit SkaggsFoundation.org or call 417-348-8998. Looking For A New Home To Get You Out Of The Doghouse? Check out our newest issue online. It won’t be ruff to find the home of your dreams! 140 acres in a picturesque valley setting located near Ongo, Missouri. This property is extremely secluded and has Swan Creek running though it providing running water for wildlife and livestock. The old home-site provides well and septic and there is electric on the property, making it a great place to build your dream home or hunting retreat. There is approximately 40 acres of bottomland pasture that is fenced and great for running cattle and/or horses. This property also has great hunting with mature hardwoods and is surrounded on multiple sides by the Mark Twain National Forest. $275,000. Very Secluded, Brand New Cabin on 40 acres of timber outside of Thornfield, Missouri. The cabin is set-up as “off-grid” and has solar power and a generator with battery backup. There is electric on the property if needed, a new well, and septic/lagoon. Cabin comes mostly furnished and features tongue-and-groove knotty pine, 1BR, 1BA with 12’x22’ covered deck. Mostly timber, approx. 8 acres pasture/hayfields, 2 creeks. Borders the Mark Twain National Forest. $134,900. Beautiful, rare 85-acre farm south of Ozark in Christian County, Missouri. This property has productive hay fields and excellent timber for hunting. The log-sided 3BR, 2BA home features hardwood floors, 6” walls, new metal roof, wood-burning stove, 2-car detached garage, and a 48’x72’ shop. Approx. 37 acres of marketable timber of mostly White Oak and Cedar. Highly sought-after Bull Creek runs through the middle of the farm, as well as a spring that produces live water all year. Borders Mark Twain National Forest on 2 sides. Located at Capp Hill Ranch Road. $550,000. 38 acres located near Hurley, Missouri next to Old Stillhouse Hollow. Property features a new 60’x40’ metal building set up and wired with 220v to add living quarters, freeze proof water tank, RV site w/hookup, newly fenced for hobby farm. HUNTER’S.... This is your wildlife paradise!! Roads thru the property that you can hike quietly to your deer stand or turkey blind. Large tracts of land surround this and QDM is practiced so trophy bucks are plenty!! This property is a GREAT recreational retreat that could be used for trail riding or hiking! $174,900. Exciting development opportunity on Highway 165 next to the Wilderness Club Resort in Branson! This 11.33 acres has already been zoned for nightly rentals and has been platted into 24 lots with electric, water, and sewer already in place for each lot! Over 450 ft of Hwy. 165 road frontage. 11 acres across the hwy. that will be on the market soon. $349,000. Prime hunting land located on Douglas/Ozark county border in Nottinghill, Missouri. Bordered on two sides by Mark Twain National Forest. Cedar and Oak throughout the property as well as openings for food plots. This property has a beautiful creek that stays wet all year. Don’t miss out on this opportunity! $88,400. The Grove at Tablerock Lake is a luxury subdivision currently under construction at Tablerock Lake near Branson, Missouri. DIRECTIONS: Take Hwy. 65 South to Hwy. 86, turn right, follow Hwy. 86 eight miles to JJ, follow JJ five miles to the entrance to the subdivision. The Grove boasts 19 lots on 14 acres with a large common area in the center of the project, 2 boat docks with 24 total slips. Subdivision features solar power, under ground utilities, a private water treatment system, and will be gated when construction is complete. Lots Range From $75,000-$225,000. Theme of project is a low-country cottage style for luxury lake living. HELP US FIGHT CHILD HUNGER! Nearly 5,000 Taney County kids go hungry over summer break. Building and connecting business and personal relationships! Whether you’re planning a wedding, or looking for ways to improve your home, join us at the Home N Wedding Show to find the resources you are looking for! Variety of vendors to choose from! FREE giveaways! Fashion Show! Stage Demonstrations! Scavenger Hunt! Dating Game! Raffle Tickets (100% of Raffle Earnings Benefit The Boys & Girls Club)! $430,000 This elegant home in one of Bransonâ&#x20AC;&#x2122;s most desirable locations has all the serenity youâ&#x20AC;&#x2122;ve been looking for! Nestled in the back of the subdivision on 1.5 acres of land at the end of a cul-de-sac, you can watch deer and other wildlife from the glass surround Ozark sunroom. No detail was spared from Brazilian cherry wood flooring to the cathedral ceilings and lots of custom cabinetry. This magnificent executive home features 4,500+ sq. ft., open floor plan, 4 bedrooms, 3 full bathrooms, Jacuzzi garden tub in master, 2 living areas, Sunroom, bonus/office room, a dining and breakfast area, lots of natural light and closet space. Also a covered patio and a large 2-car garage with work area. Move-in ready with some furnishings negotiable with sale.